Lip balm is not created equally. For just a few dollars more, you can buy lip balm without palm oil. As always, the less ingredients, the better. 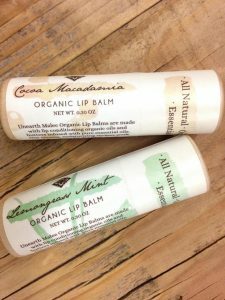 We looked at two lip balms from the same major manufacturer. Both definitely contained palm oil derivatives; however, one had 19 ingredients and the other contained 49! Check out their extensive product list. All of their balms are palm oil free. They also offer lip tints. 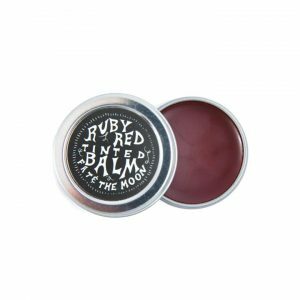 This vegan balm is unflavored and unscented. It’s free from tocopherols. Ingredients include sweet almond oil and wild-crafted candelilla wax. 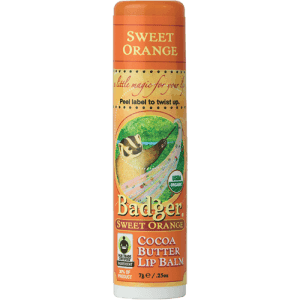 This was the first palm oil free lip balm we found and used. We love it! Booda Organics makes all of their products without using palm oil or derivatives. You can use this for more than just lips. It’s makes a great salve for burns, cuts and bites. Heals skin. It’s organic and shelf stable without the palm oil derivatives many companies use. Ingredients include calendula and Oregon grape leaf. This is balm you can use for your lips and cheeks. It contains essential oils of clove and sweet orange. 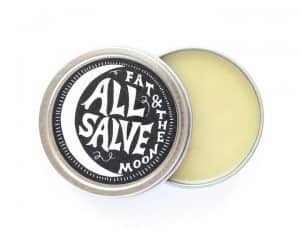 Fat and the Moon has a wide variety of products, all of which are palm free. Freedom Soap Co. is another company who doesn’t use any palm oil or the hundreds of names for palm oil derivatives. Wow, what a huge range of palm free flavors. They have confirmed the Tocopherols in their lip balm is from sunflower and not palm oil. They use raw, organic and vegan ingredients. Hurraw! is another company who believes in the importance of making their all of their products without any palm oil ingredients. These are packaged in an eco-friendly, push-up paper tube. All of Uncommon Mallee’s products are free palm oil and palm ingredients. Also, they highlight a “No Palm Oil” icon along with their “Organic” and “Vegan” imprints. 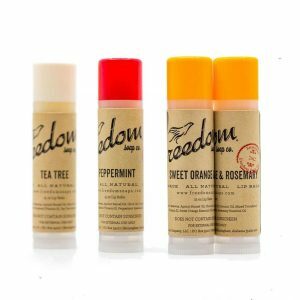 Simply Eden has confirmed their lip balm flavors are all palm oil free. Kiss My Face confirmed this balm is palm oil free. Palm oil derivatives are common in lip balm. If the company doesn’t name the source, these ingredients are typically derived from palm oil. You will need to contact the company to ask. The more you learn about palm oil uses and names for palm oil derivatives in everyday products, the easier it is to avoid them. When companies add flavors and other characteristics — soothing, moisturizing, medicinal, tinted, sun protection, hydration, etc. — there are greater chances for them to have palm oil ingredients. Don’t be swayed by labeling. Just because lip balm labeling states “coconut” doesn’t mean it’s palm oil free. Watch for labels that promote “all natural” and “plant derived ingredients.” These all can contain palm oil. Shop at local stores and natural food stores. Your Target, Walmart and Walgreens are less likely to carry palm oil free products. Check out your Whole Foods, Natural Grocer, Sprouts, etc. for varieties of small batches. You may find them on Etsy and craft bazaars as well. Keep away from major manufacturers, especially ones who offer many different types of lip balm. Companies use palm oil because it’s versatile and inexpensive. Generally, the more expensive the balm, the better chance it won’t have palm oil derivatives. Lip balm is fairly inexpensive to begin with. By spending a little bit more, you will be able to avoid palm oil. Choose balm with less ingredients. Simply put, the less ingredients, the less chance of palm oil. There are many sites that show you how to make your own lip balm that is palm oil free. Here’s one that suggests using coconut, grapeseed or sweet almond oil. There are many environmental reasons consumers choose lip balm free from palm oil. There are many animals now on the endangered species list because of palm oil plantations. You can do your part by choosing lip balm without palm oil. By making simple choices, you can choose the products that make less of an impact. Be sure to always read labels. Companies change ingredients regularly. This list is not guaranteed and is meant to be a starting point. Please list any other lip balms without palm oil in the Comments. We’d love to research them and add them to this list. Please be aware that Carnauba wax is made from palm wax and many lip balms contain this ingredient. In fact Badger Balm’s tinted ones have it. I did not see carnauba wax on the long list of names of derivatives from palm oil but it should be. Carnauba wax is also used on gummy vitamins and candy like gummy bears. I found out about carnauba wax when I took a gummy vitamin and my mouth and throat became itchy and I broke out in hives. Also candles can contain palm wax. I don’t know if it would cause a reaction from burning it but personally I don’t want to support the use of this ingredient in anything including a none consumable item. I will only burn candles that are 100% coconut wax since it is the safest and healthiest choice. Hi Tammy, Thanks for writing! Months ago we asked one of the founders from the Palm Oil Free Certification Trademark (www.palmoilfreecertification.org) about Carnauba Wax. She said it is NOT derived from palm oil. It is from a Brazilian palm — Copernicia cerifera — which is different than palm oil and its many forms. The palm oil we avoid is from Elaeis guineensis. Of course, this isn’t to say you don’t react to it; just letting you know that it’s not derived from palm oil. And yes, so many candles, especially less expensive ones, use palm oil. 100% coconut wax sounds like a great choice. Thanks so much — we always welcome your thoughts, suggestions, etc. If the medical community won’t help us, we have to help each other! Sorry for the misinformation that I gave. I didn’t realize that it was from a different palm tree. That’s good to know. I must be allergic to both. We are all learning together! We welcome all of your comments and ideas, Tammy. Thank you for being so proactive in sharing your thoughts with us!